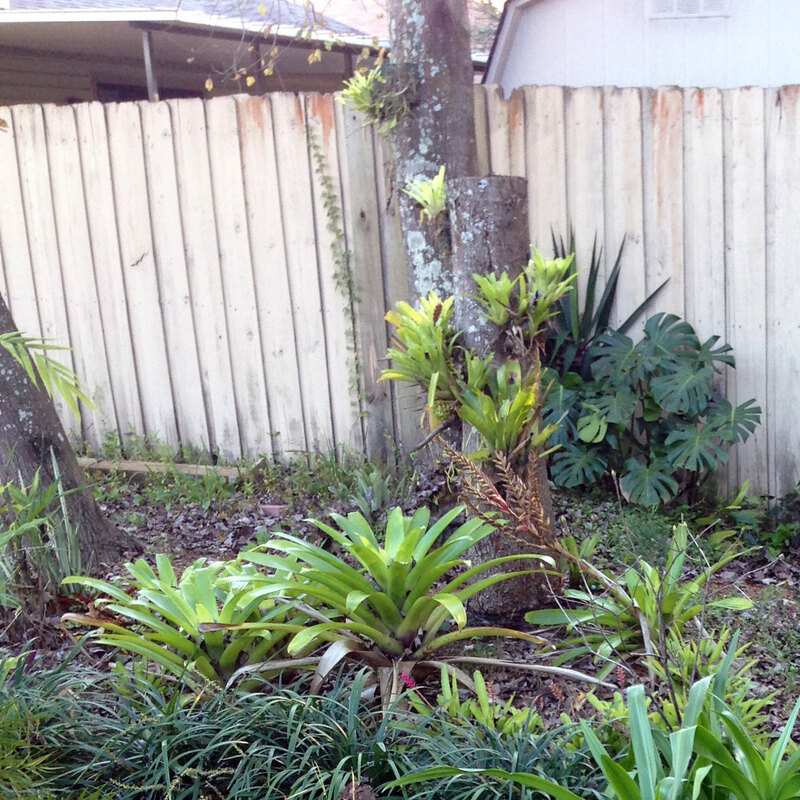 The bromeliads in the foreground are mounted directly on a tree stump. Ever since my little apartment balcony garden, I’ve daydreamed about creative ways to grow epiphytic plants such as bromeliads, orchids or Rhipsalis. 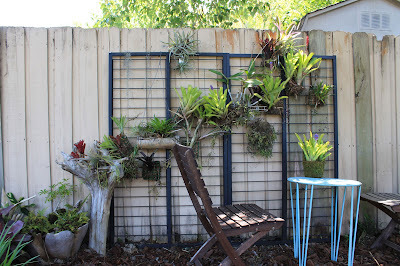 I came up with something called a ‘rainforest drop’ and even turned a dead tree into a bromeliad garden, but after a couple years of trialing these suet basket planters, I can say that this is my easiest and most affordable idea yet: A vertical garden made of cheap suet feeder baskets, sphagnum moss, succulents and epiphytes. - A suet feeder basket – Find them at the dollar store or anywhere else bird feeders can be found. - Sphagnum moss – Long grain sphagnum moss works best. 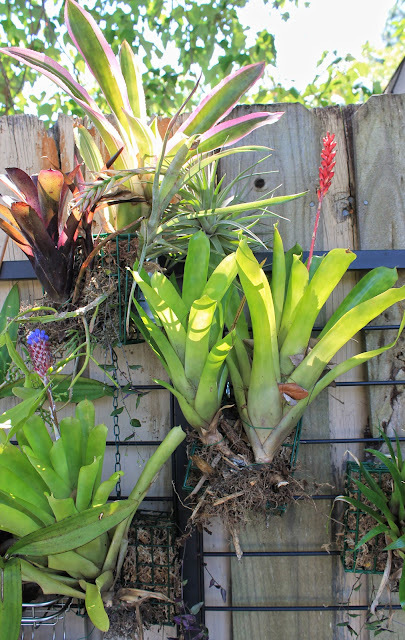 - Florist’s wire – It’s affordable, easy to use and keeps your bromeliad in place. 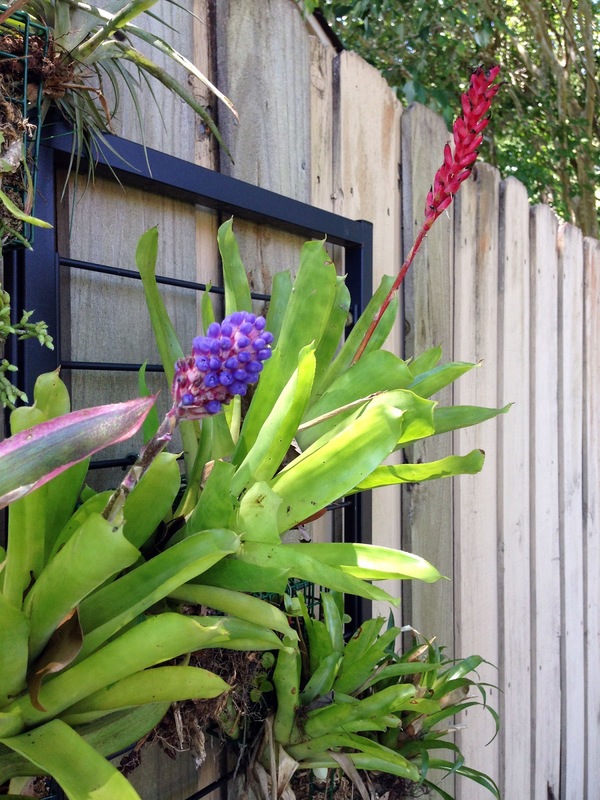 - A bromeliad - Any bromeliad will do. Since I live in zone 9a, I chose cold hardy types that I can leave outside. - (Optional) Cuttings - I like to use Rhipsalis, (an epiphytic cactus) Hatiora, (another epiphytic cactus) Peperomia (another epiphyte) and Tahitian Bridal veil, but sedums and any other easily-rooted succulents will also work. Stuff the suet basket with moistened long grain sphagnum moss. 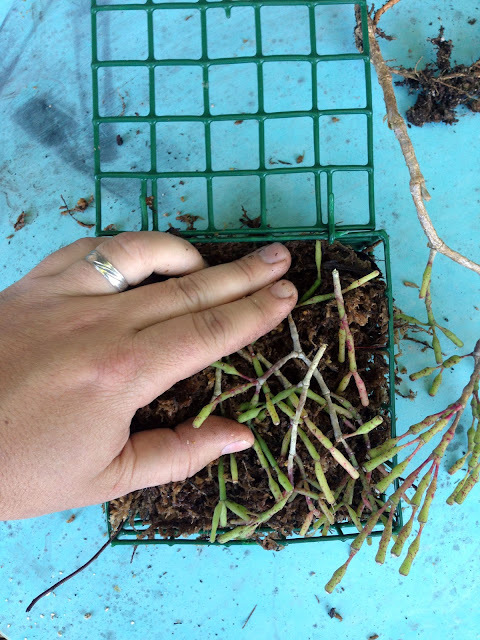 Insert small cuttings (Such as Tradescantia, Sedum or Rhipsalis species) and close the basket. 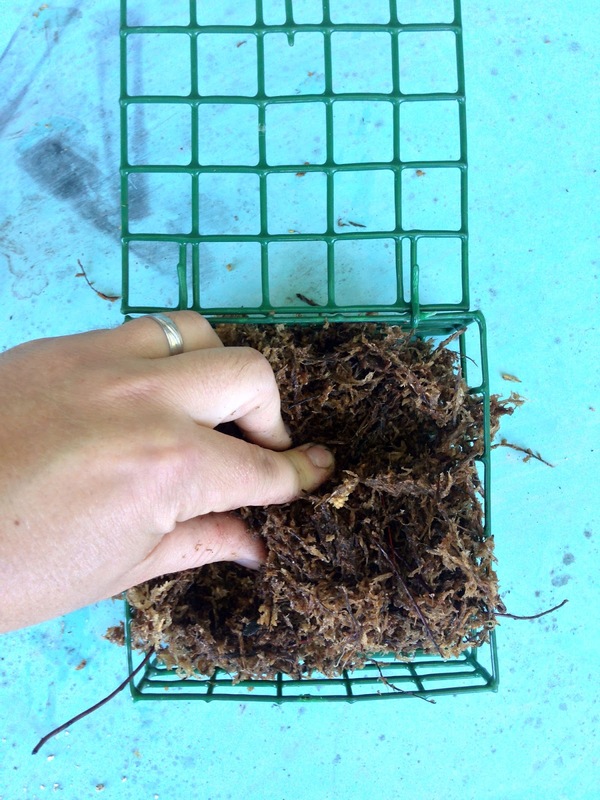 If you’re using a top-loading suet basket, you can tuck the cuttings in afterwards instead. I even went back and tucked Tahitian bridal veil (Gibasis geniculata) stems into each of the baskets when I was done so that they’ll form a lacy screen over the metal frame. 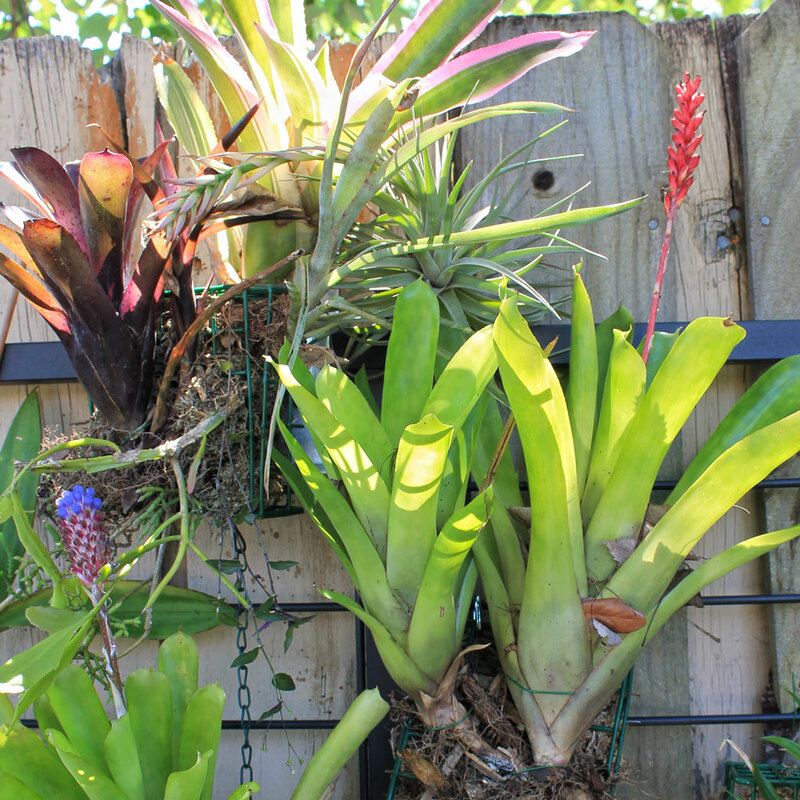 Place a bromeliad, orchid or succulent against the basket. Fold a long florist’s wire (or any flexible wire not containing copper), in half and wrap it once around the woody looking stem. 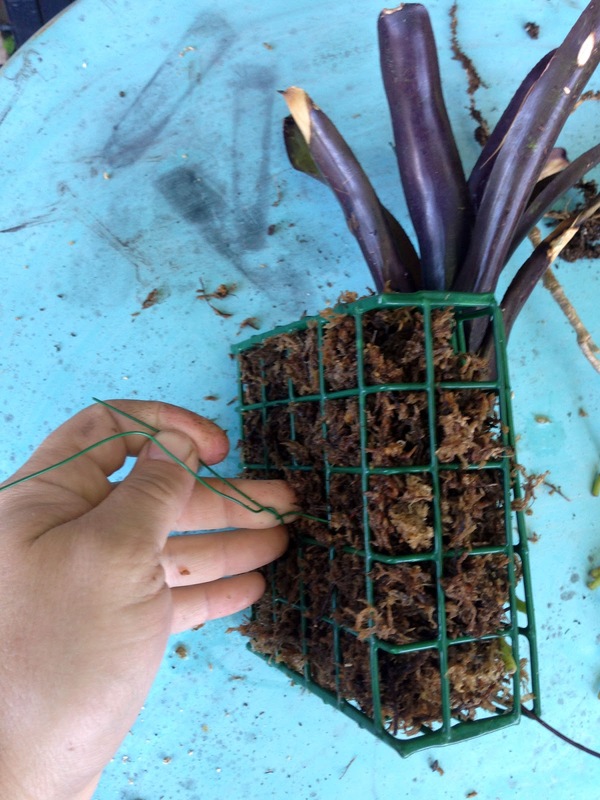 Pull the wire through the basket tightly and twist the two ends together on the other side to attach the bromeliad. The bromeliad will need to stay upright to collect water in its vase, so lightly wrap twine around the upper portion and the basket to gently hold it in place. To the left of the finished birdseed basket planter is an established Rainforest Drop. 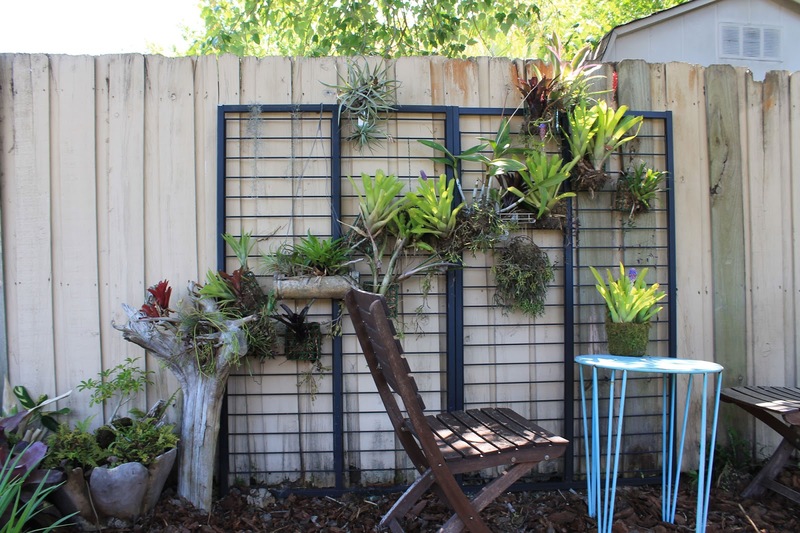 Hang the planted basket on a fence, tree or anywhere that receives the appropriate sunlight for the chosen plants. 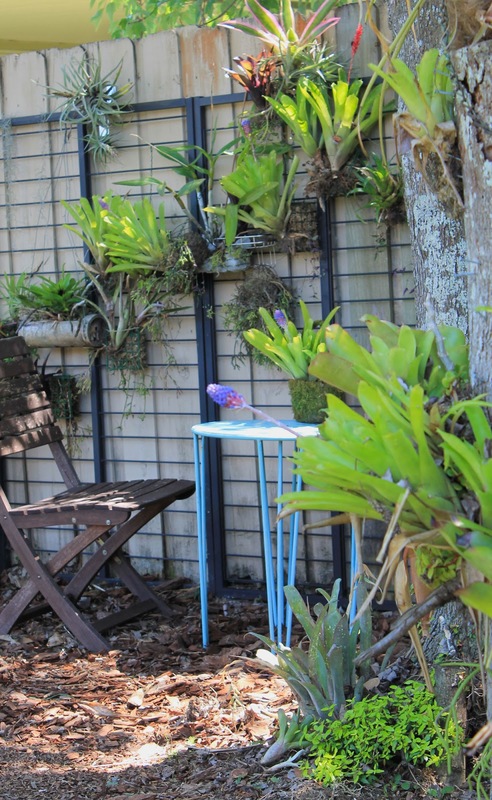 Most succulents prefer full sun, while epiphytes such as orchids, bromeliads and Rhipsalis do best with shade in the afternoon. As you can see in the photo above, I've used a metal rack. 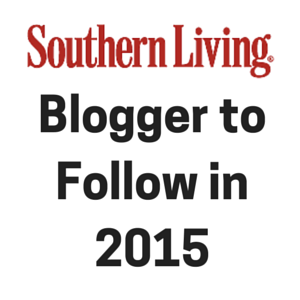 Read on to find out why I did it and how to make your own. Epiphytic plants will be able to withstand some serious dry spells once they've become established, but first they have to form a good root system.Care for your new birdfeeder basket garden by keeping the sphagnum moss moist until roots begin to form. 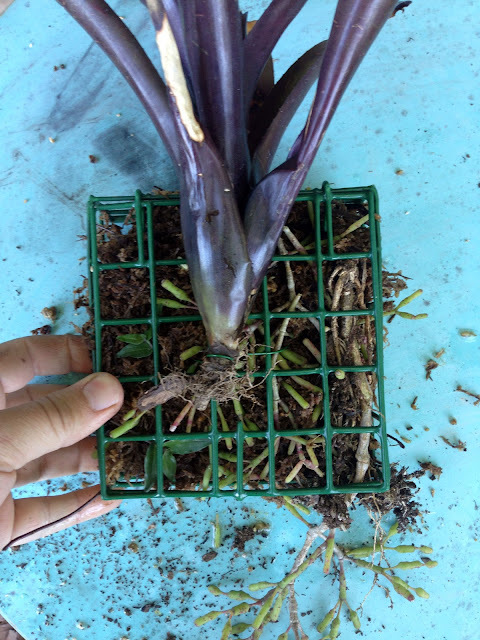 I rarely fertilize my rainforest drops or birdfeeder basket gardens nowadays and they still seem to do fine, but the plants will definitely take on a lusher look if you fertilize with compost tea or orchid food. Before: This ugly fence needed a makeover. I added mulch and played around with different ideas before finally attaching the metal racks. 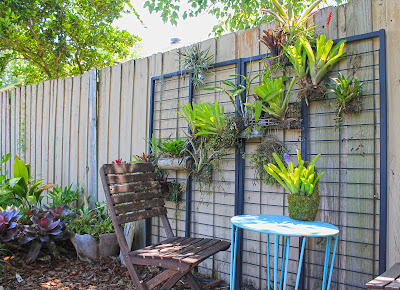 Right now the planting looks like a bromeliad-covered branch, but will also use spanish moss and other draping plants to cover the metal frame and create the illusion of a lush and foliage-filled space. I may even plant a well-behaved vine at the base to add even more depth and dimension! 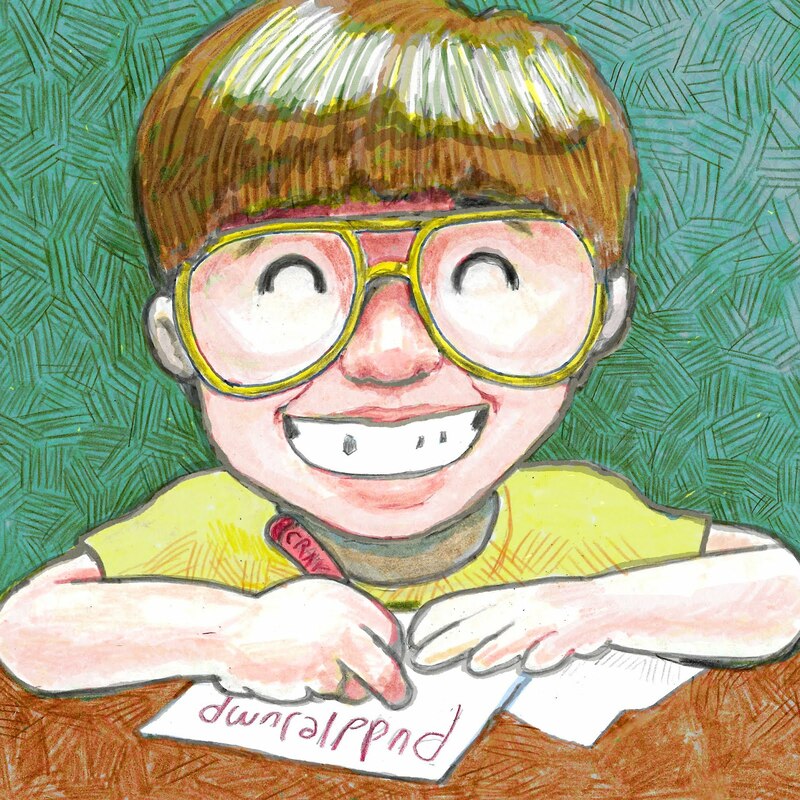 So far I’m pleased with the results. 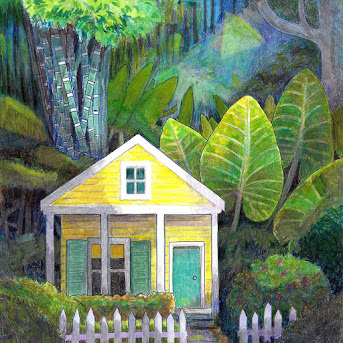 In the middle of the afternoon when nothing looks good in the harsh sunlight, dappled light pulses through each bromeliad in a constant laser-light show of glowing greens, pinks and purples. Lizards, bugs and cardinals come out of the woodwork over the course of a day, and before long I’m sure to find treefrogs as well. How did I find the metal racks, you ask? 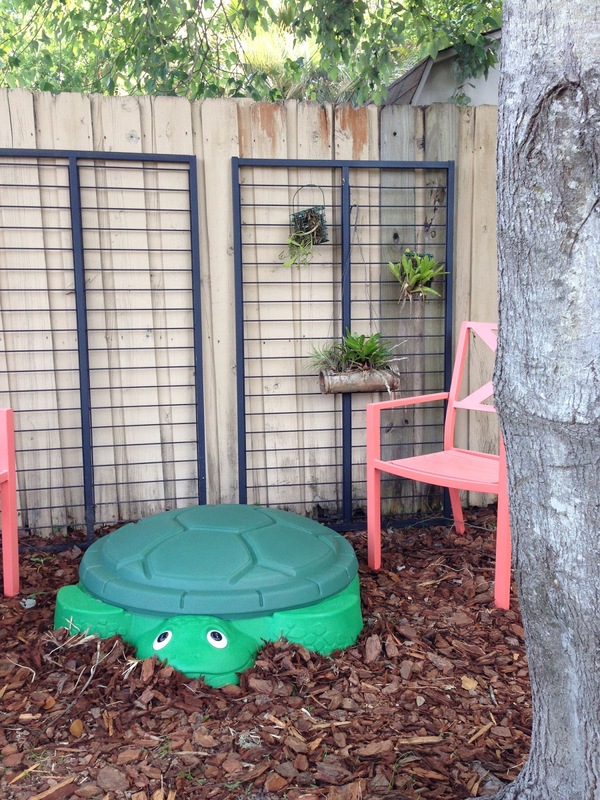 I was lucky enough to reclaim some retail fixture pieces that were headed to the landfill, but you can find something similar by looking around the dumpsters behind retail stores or by purchasing something similar online. 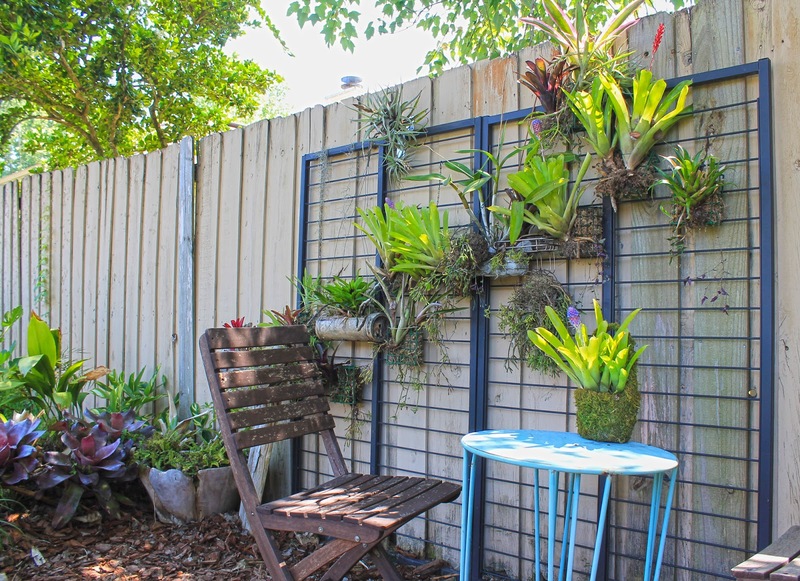 Another benefit of finding a sturdy support like this is that you can hang up pots to create a living wall of flowers, vegetables or ferns. 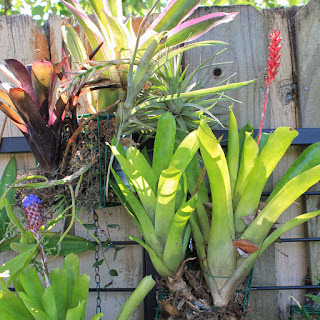 I chose epiphytes and succulents because their lack of soil makes them lightweight and because they rarely need watering, especially during the summer rainy season. The mounting bracket (found at a hardware store) is hidden by the plants. Mounting the fixtures was easy. I’ve attached the frames with nothing more than a bracket above each one, so that they can be slid out to the side for easy maintenance. Since the frames are sitting directly on maple roots, there was no need to mount the pieces up on the fence. The hard, root-packed ground supports most of the weight. 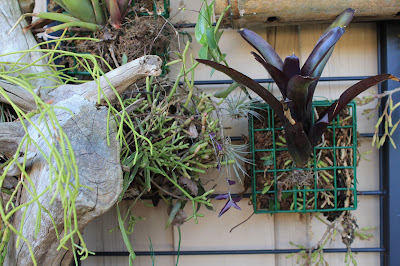 The planters themselves are hung using the florist wire or ‘s’ hooks, and the racks also allowed me to hang other stuff like my rainforest drops and shower caddy orchid planters. Stay tuned to see how this vertical garden develops over time! I'm really excited about how it turned out and can't wait until it fills in to cover the metal frame. 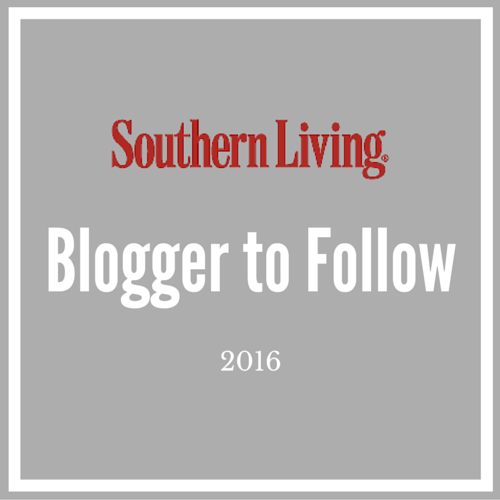 Since I've surely left out some important detail or instruction in this post, please leave a comment or send me an email (link in the sidebar) if you have any questions. cute idea. 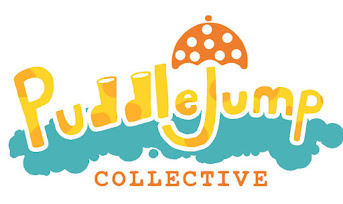 I came across your site trying to find something on growing orchids in showers. I have THE one for it (I think). Glass block on three sides to 9 feet. Room for two wheelchairs. three shower heads. It is beautiful as it is but the idea of having orchids and such dripping off the sides has been driving me crazy. It really got started after we put an ivy in there that is happier than it has ever been.